Their lives crossed when CÃ©cilia stomped out of the ÃlysÃ©e and Carla landed the role of l”Ã©pouse du prÃ©sident. CÃ©cilia walked out of every major endeavor, while Carla built on her opportunities. CÃ©cilia abandoned a promising modeling career in favor of marriage, while Carla became a supermodel. In her youth CÃ©cilia shone as a pianist, only to quit after her first concert. In contrast, Carla marketed her latent interest in music when she fell out of fashion. Before the world grew tired of her singing and strumming, Carla became the skilled diplomat we see today, something CÃ©cilia, having spent years in the trenches by Sarkozy’s side, gave up at the first sign of victory. In this gross simplification, CÃ©cilia stands for those permanently dissatisfied women that we all know who find no romance in their achievements. They take a harsh-realist approach to life that dulls the imagination and ultimately condemns a project. Bruni rejects any notion that le destin se moque bien de nous (fate mocks us) in her song Quelqu”un M”a Dit. Happiness, she suggests, is ours to pursue and enjoy. Happiness, individualism, creativity, and pride, packaged in a slender beauty”Ayn Rand would certainly have taken notice. 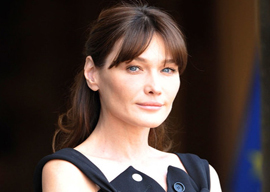 Carla Bruni does have that Randian quality of self-assertion in the face of establishment, but instead of being “armed with a vision” she is delighted by a vision. There is to her story a natural degree of uncertainty, entirely lacking in Rand’s novels, whose heroes come into being with a perfect and definite plan. Bruni is open to possibility. Arguing at length about the merit of her songs, looks, or gestures would miss the point. It is the idea of a passionate woman who can truly grab an opportunity and then move on to other endeavors with conscious deliberation and joyful maturity that gives Carla Bruni the power to inspire.